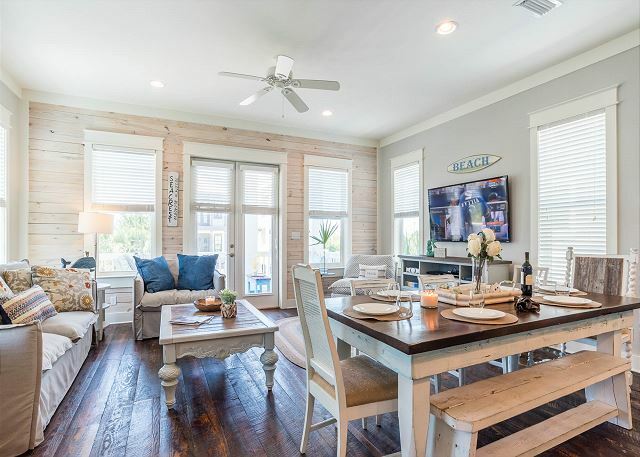 Located at the front of Seacrest’s expansive neighborhood, “Sea La Vie at Seacrest Beach” is a beautiful beach retreat offering spacious accommodations for 12 guests in 4 bedrooms and 4 bathrooms. Thoughtfully designed with guests in mind this luxury home is an ideal place to escape and enjoy the Florida sun and sea breeze. This easy going neighborhood, identifiable by the large beach chair at the front of the community and palm lined streets, is the perfect place to spend your next getaway boasting a 12,000 square foot community pool. Seacrest Beach is within walking or biking distance to the Emerald Coasts famous sugar white beaches and steps to the Seacrest Town Center or Rosemary Beach.